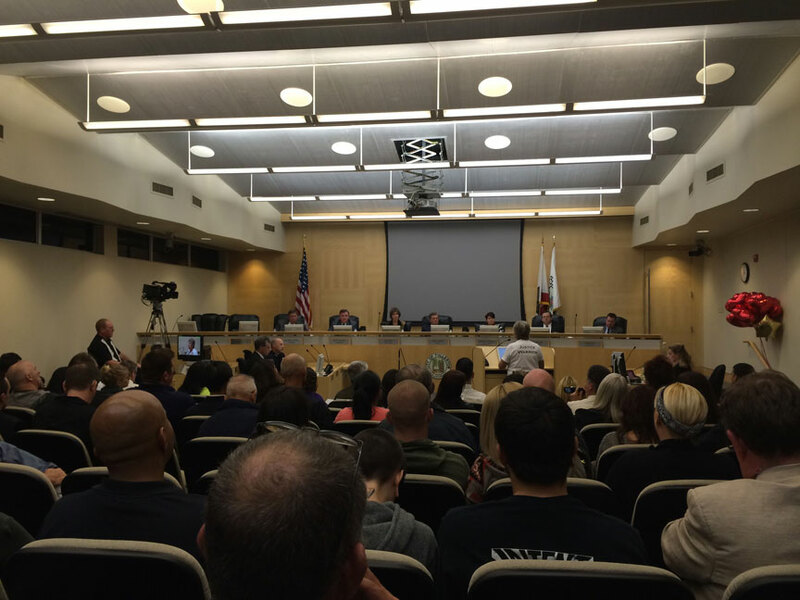 The Fullerton City Council moved item twelve, an update from Chief Hughes about the trial of two former officers acquitted of charges in the death of Kelly Thomas, to the beginning of its meeting agenda tonight. Of the fifty or so members of the public who spoke about the item, nearly a dozen expressed support for civilian oversight of the Fullerton Police Department. Following public comments of the issue, Councilman Bruce Whitaker reminded the audience that he did support a public police commission, and voted against the proposal to hire the Office of Independent Review to provide a lesser model of oversight through outside audits by Michael Gennaco’s OIR. 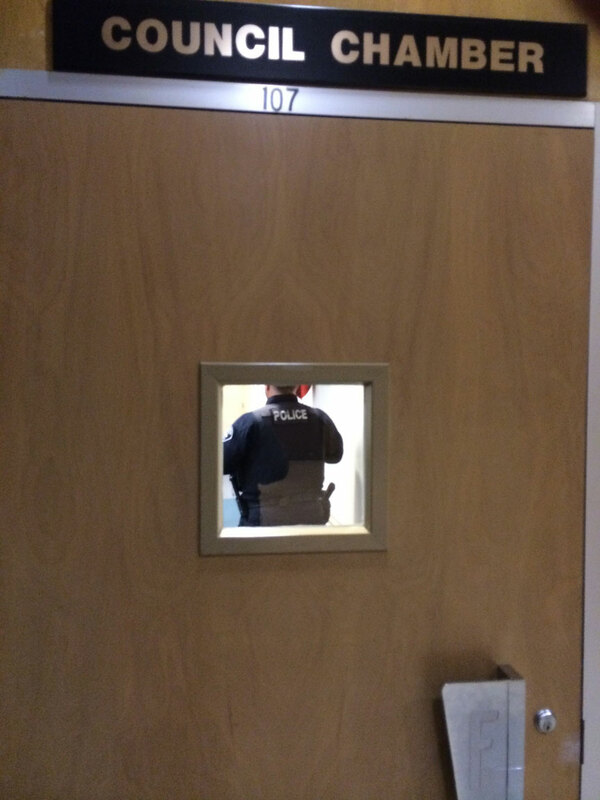 Councilwoman Jan Flory claimed that the subject was dealt with on two different occasions, and even cited a study session held at the new community center as an example of the council’s consideration of different models of oversight. Readers will recall that the Police Oversight Proposal Committee (POPC) was limited to less than ten minutes to present a model of public oversight following lengthy presentations by the chief of police and Michael Gennaco. Almost no discussion of the proposal took place at that time. There has never been a real public discussion of police oversight by the Fullerton City Council. Readers will also recall that Ms. Flory was supported by the Fullerton Police Officers Association in the 2012 elections. The FPOA spent tens of thousands of dollars to ensure that they elected a candidate who would privilege their priorities over the interests of the public. Ms. Flory claimed that the POPC proposal was in conflict with state legislation that protects police officers, and that the council was advised by lawyers that they should not adopt a civilian police commission. Of course, The Peace Officers Bill of Rights does severely limit the public’s access to information about police misconduct, making real oversight somewhat complicated. But such civilian oversight is certainly not impossible, and is vital to a community where people can be beaten in the streets by the police and be found guilty of nothing by a jury. Councilwoman Flory ought to take the public’s demands for civilian oversight more seriously. If she thinks state law is standing In the way of it, we will expect her leadership in efforts to change that law. We request that she contact our state legislators on behalf of the people of Fullerton to reform POBR. 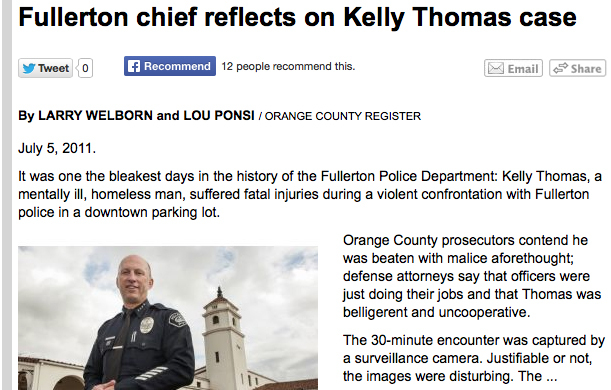 Most striking is the Chief’s opinion that it was only a “small segment of our population that was very loud that lost its trust for (sic) the Police Department,” as if he has any reliable way of measuring how much confidence the people of Fullerton have in a department whose officers needlessly beat a man to death, and now await trial for murder and other crimes. Three city council members were handily recalled by a clear majority in May, 2012, less than a year after Kelly Thomas was killed. Chief Michael Sellers eventually resigned. Not exactly ringing endorsements of the FPD by the public. Later in the article he is asked whether there was “ever a real danger of disbanding the Fullerton Police Department.” This question should be answered by the reporters themselves, based on information collected from multiple sources. Instead, they rely on Dan Hughes to explain that “It never got to the point where the council ever even voted to get a bid.” He is correct, the vote to pursue a bid from the Orange County Sheriff to provide police services for Fullerton narrowly failed on a 3-2 vote after the Fullerton Police Officers Association filled the city council chambers with their members and supporters to oppose the vote. It could easily be argued that it was the FPOA who were the small but vocal minority who opposed outsourcing their own jobs. In the November 2012 election the FPOA spent over $ 35,000 supporting city council candidates who could be relied upon to keep the FPD, and even then only one of their chosen, Jan Flory, squeaked by with a 29 vote lead over incumbent Travis Kiger, who had been a strong critic of the department. Clearly, the jury is still out over how much the public fully trusts the Fullerton Police Department. When asked whether or not the FPD got an “unjustified bad rap” Chief Hughes responds that lies were told about the department, but doesn’t bother to say what lies or who told them. He does acknowledge that the police did not communicate well “about events that happened,” but, again, is not specific about anything at all. He asserts that “we have taken corrective action.” Perhaps he refers to the FPD’s official information site, Fullerton Police News, where we can read all about a police dog’s first drug bust or how to have a safe holiday season.